Kyle Knits - a boy, his cats and way too much yarn: Happy Birthday Gregg! 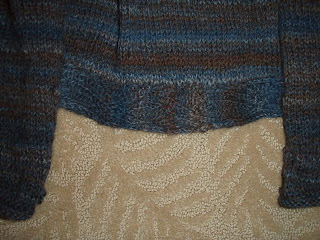 Yesterday was Gregg's 39th birthday, and, since I have been out of town because of my father's passing, I didn't get his sweater completed! I put the half finished item in a box and explained to him that I had been working on this since November of last year - but only at the yarn shop and only on Saturdays - I got stuck and couldn't move forward because I had never attempted a raglan sleve. Now that I see how it works (kind of) it seems pretty easy. Better still, now that he has seen it, I can work on it at home in front of him. 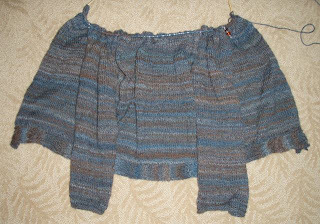 The pattern is "Avast" from knitty.com - and while I have found a few glitches in the pattern, they were nothing that a moderate knitter such as myself couldn't decipher. (for example, when it is time to join the arms to the sweater, the counts were off for knitting - instead of the directions that were given, I just knit to the bound off part under the arm (on the row before, it was something like p45, bo 4, p 95, bo 4, purl to end) and then knit on the sleeve, when the sleeve was done, I continued past the 4bo section, then the other sleeve in the same fashion. As far as I can tell, it all looks like it's lined up correctly. Only time will tell!